This is a definite improvement on the original game. 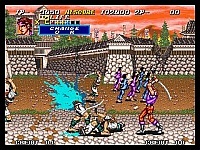 It isn't groundbreaking but is still an enjoyable game and better than the majority of lacklustre side scrolling Beat 'em ups on the Neo Geo..
You still get sucked into another dimension (or whatever it is supposed to be) every now and then and you still get to change between characters. 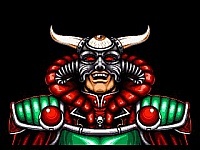 This time however, you can change into the other characters right from the start. 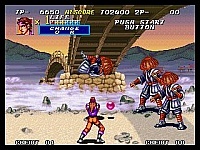 These include the normal character, a ninja and a wolf. Aside from that, it still plays the same although somehow it does feel slightly better than before. It is a bit faster and is also easier than the first game. One of the faults of the first game was that it could be too hard at times, but that problem has been somewhat rectified with a slightly easier gaming experience this time around. The graphics have been improved considerably. The backgrounds and characters look more detailed than before and there are some really nice special effects in places. The animation hasn't really improved that much, which is annoying, but I suppose it can be excused. The sound has also been improved with some fairly decent medieval style music and ever so slightly better sound effects. This game is still not amazing (not by a long shot), but is worth a look nonetheless. As I said, it is a definite improvement on the first and better than a lot of the other side scrollers. 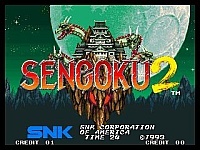 So, Sengoku 2 gets the dubious honour of �best side scrolling beat �em up on the Neo Geo� (at the time of writing, but Sengoku 3 eclipsed this game in my opinion).